Yardage - Whole Yards Only Note ! If you need more than the 103 Yards we currently have in stock, please make a different selection as additional yardage is not available. In stock yardage is typically shipped within 2 business days. 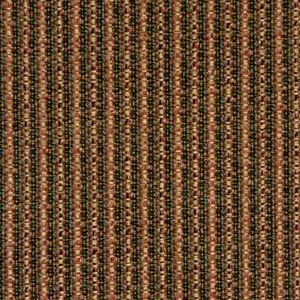 This is a repp or ottoman weave design in terracotta and gold with accents in forest green, woven in 100 percent solution dyed nylon. Nylon is known for high strength and excellent resilience. It has superior abrasion resistance and high flexibility. Solution dyed fibers and yarns are colorfast to most destructive agents. Suggested uses include residential and commercial upholstery.